The crosscut of The Butternut Tree hearkens back to summers spent daydreaming under the butternut tree in grandma Grace’s garden and gathering fruits, vegetables and wild plants in Sackville, NB. The tree rings symbolize Canada’s diverse bounty of natural ingredients—hidden in plain sight—waiting to be explored and shared with present guests and future generations. The tree is a symbol of stability. We want to be part of the community for a long time and for that you have to build strong roots. The illustrations remind us that the story of Canadian food is a process of discovery. 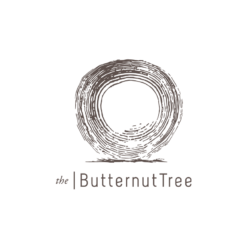 Reminiscent of the notes that Chef Downey has taken over the years, we wanted to share our intimate thoughts of what the Butternut Tree is about and our exciting discoveries.